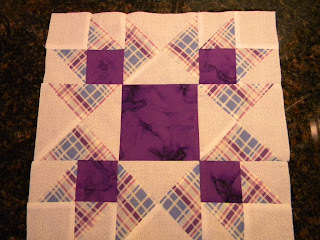 I got a block done, as part of a small group of internet friends' monthly swap. Each month, one of our members chooses the block they want made, send out fabric, and specifies a block they would like and we provide the background, or the other fabrics. Then we send the completed blocks back to that person. This month, it was Moira's month. She sent out the plaid fabric, which I absolutely love, and would have kept if I could have. She asked that white-on-white be the background and we provide the center color and 4 squares. This block was from a handout called "Mocha Trail"
My month was supposed to be September, but since we are just about ready to leave on vacation, I switched my month to November instead. 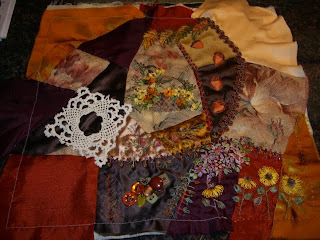 I just finished working on Debbie H's Autumn RR. I worked on this corner of the block. Rengin's lovely oya flowers (the burgundy and white ones). I had anxiously awaited my order and they arrived early this week so I could add them to this block. and a herringbone, lazy daisy and beaded seam. And lastly one of my hand-dyed leaf motifs. This is the whole block, now packed up and ready to be shipped off to Rita. Another block I finished several days ago was this summer do-your-own block. This was another round robin in which you do your own block. I knew, from reading Lyn's blog that this was a California summer at the beach. She also had a contest at the time to name the guy in this picture, he was an Olympic star, and used to be in the movies. I thought to myself at the time it was Johnny Weissmuller, Tarzan, but was unsure of myself, so I didn't guess in her contest, and found out later I had been right. Anyway, I chose to work on this block, as I am a California beach girl, even though I was born in Maryland and lived there the first 13 years of my life. 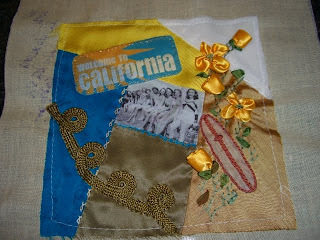 I found in my sticker stash, a sticker that said Welcome to California, so I printed it up on fabric. I had also been saving the wave-looking trim for this block and added that. I added a surfboard, and some California poppies. I hope Lyn likes what I did. 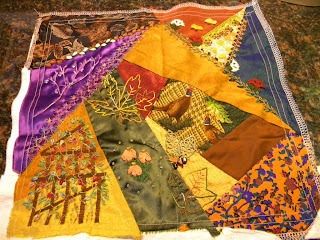 This week I finished up Marci's block for the Flower Fairy RR. My picture is atrocious. I have to figure out what I am doing wrong and start getting better color representations. This RR was one in which we send six 6" blocks around and each person chooses the one they want to work on. I chose the Lavender Fairy. I hand-dyed the daisy trim and the butterfly. 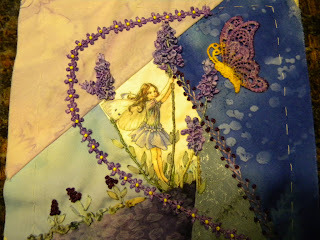 I I extended the lavender out beyond the silky of the fairy in the center. Jo, is having a 600th post giveway here. 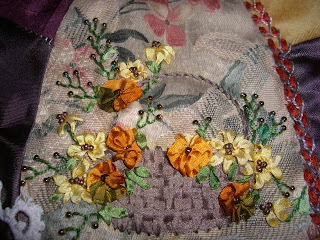 I have followed her blog for several years now and have thoroughly enjoyed seeing her beautiful work. Jo also has an Etsy shop here. I can personally recommend her excellent Seams Like Fun seam treatment book. She also has some lovely items for sale. Jo also has an another Etsy shop here called Vintage Vices, which is new to me, and has some vintage doilies and hand embroidered items for sale. 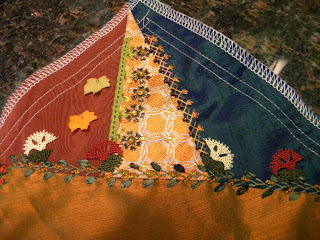 I recently finished up another block for the Autumn round robin. This was Debbie S. block. She had really lovely muted colors in her block and it was a joy to work on. 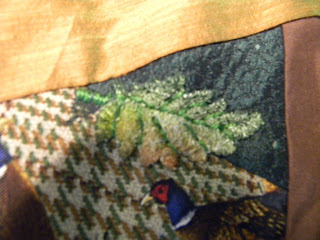 The first thing I did was embroider one of the motifs I learned from Sharon B's class in Silk Ribbon Embroidery. I thought this basket of flowers would be perfect for this block. I changed the ribbon to look more fallish. 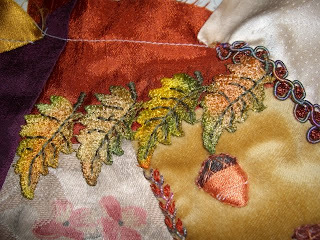 I also added the rust-colored braid along one seam, and the hand-dyed leaf trim. 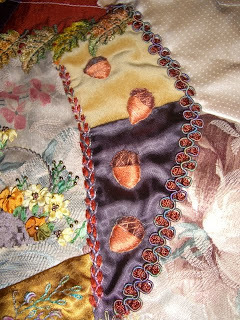 Lastly, I did some acorns in stumpwork and had them falling down 1 section. This was the whole block after I had finished.